The name had started to spread. Most of it good enough, popular opinion was that the guard had what was coming to him. The story that filtered through the city thankfully swapped out Kaellax for a nameless mage, but I was painted as the young hero that found the nullification stone, rescued the woman and then simply sent the soldier for a swim when he refused to help. Mostly truth. I had indeed teleported the attacker in a rage, but the soldier hadn’t been my target. It had just… happened. So now I found myself dressed in my finest clothing and visiting the Stormwind Keep, which was still under the final stages of construction. I was to be presented to the King and the House of Nobles. Maron assured me I had nothing to fear, but I wasn’t so sure. 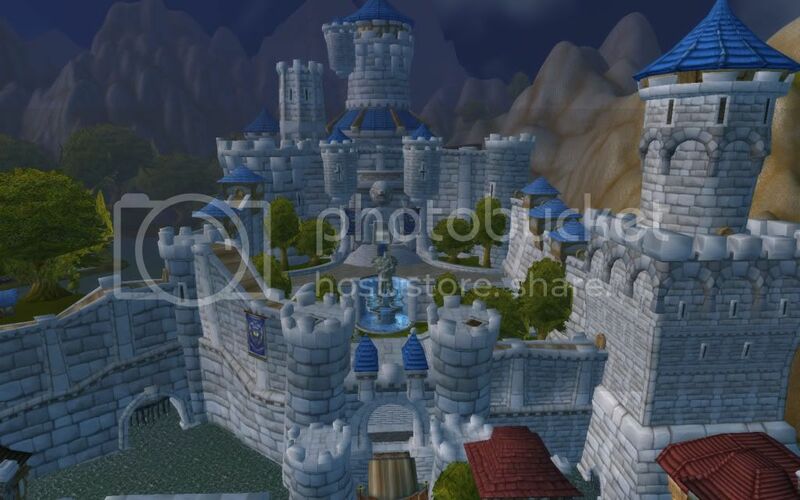 The Stormwind guards were powerful men and no doubt friends to the nobles. I recounted the story, opting to make myself look a little arrogant rather than foolish. I mentioned that the guard implied the innkeeper was lying, despite having arrived as the attack had started, and I admitted that in my anger I may have teleported the guard to the ocean, but the intent was never anything harmful and I was quick to retrieve them from the cold water once I had sent them there. Others in the room laughed. The guard quickly opened with a detail of his morning route through the Mage Quarter. He mentioned walking through and hearing my call for help, rushing to the scene, and then he started to drift. He mentioned the money spilled across the floor and Kaellax’s unbuttoned blouse. He explained that the Slaughtered Lamb was known as a hive for criminals and warlocks. The innkeeper, in his opinion, had simply been making a deal when the young mage had arrived. To save her embarrassment, she had chosen to look the victim. He said all of this as though it were fact, even going so far as to read it from a piece of paper as though it was some kind of recorded testimony. This was awful. Kaellax had not been brought here, mostly because Maron told her she needed to stay as far away from this as possible, but with the guard telling one story and me telling another, it was his word against mine. The older man seemed to be thinking the same thing. At first I was confused, but then I saw him… the man from the inn, the very man that had attacked Kaellax! They were using him as the witness! Now, I was terrified. This guy would benefit if he just told the nobles that I was lying. If he did, it would be noted that Kaellax was guilty of a crime, not him. He would lie without a moment of hesitation. I dared to look at the guard across the way, expecting to be a smug grin. Instead, he looked like he’d seen a ghost. “State your name,” the old man said to the prisoner. “Then?” The old man encouraged. There was a loud noise as all the nobles started talking to one another at the same time. Maron was smiling and patted me on the shoulder. I couldn’t believe it. Why would the prisoner have been so honest when an easy escape was within his reach? Was he truly so racked with guilt that he had confessed? Could have been a lot worse. I gave a nod and waited to be dismissed, but the dismissal didn’t come. Instead, the nobles murmured some more and the old man once again spoke. The guard began to weep. He continued to weep as we were both taken through the city streets to the stockades. He wept louder once we were both placed in our separate cells. The sun went down and his weeping continued unabated by the darkness. Finally, I decided to open my big fat mouth. “Why did you lie?” I asked. I heard Kaellax words echo in my head. She had said the same thing when I had called the guard in the first place. “I guess I don’t,” I said. When the morning came, the guards came and took the man to his execution. An hour later, Maron arrived to tell me that it was done. Maron handed a roll of paper through the iron bars and I looked it over to see it was a ticket for passage aboard a ship heading North. “I’m going to learn how to control fire?” I asked. “What about the Sepher Manor?” I asked. When Maron left, my excitement continued to build until I couldn’t stand it any longer. When I was finally set loose the next day I rushed straight to the docks and found the ship that would carry me back to the North. They told me it would be a few more hours so I quickly rushed back to the Mage Quarter in hopes of seeing Lady Sonea before I left. Instead, I came to a terrible site. The Slaughtered Lamb had been torched. The only thing that remained were the stone frames used to hold the wooden structure in place. Several people were hanging around the scene, but I stepped up and found Kaellax standing in the main area sifting through some of the debris. I thought about continuing on the Mage Tower, but I knew the ship would be leaving soon, so I headed that way instead. Maron had sent Surfal on ahead for transport, so I didn’t have to get anything other than some money for supplies. By the time I got back to the harbor they were making final calls for passengers and cargo. I rushed halfway up the ramp before I heard the pop of a transportation and knew that she’d come to bid farewell. I stepped back down the ramp where Lady Sonea was waiting with extended arms. “You’ll write me every now and again?” She asked. “Will you come back to Dalaran too?” I asked. “I think I’m learning that one,” I said, thinking of the guards. “Evanor wouldn’t believe it,” she replied jokingly. I was about to say more, and she was gone. I rushed up the ramp just as the impatient captain started to drop the sails and get us moving. We were bound for the north. I would return to Dalaran and begin my advanced training in fire magic. What I did not know, of course, was that the guards of Stormwind had every intention of killing me in the night if I had stayed in the city. Uncle Maron and Sonea both knew it was coming. Kaellax knew too. She purposely left her inn vulnerable that night so that the guards made destroying it a priority over killing me. They all worked together to orchestrate my swift escape from a very dangerous position. Of course, all I was thinking about was conjuring fireballs and saving the world. Our youthful ignorance is such a dangerous construct. Previous Post Season 2 — Episode 9: Home Sweet Home?